Lexco now distributes Do Wrap Performance Headware, the headwear of choice for professional and amateur athletes serious about sweat control and comfort. Do Wrap uses the latest in technology and materials to wick away moisture and keep sweat out of the eyes. Fabrics, including DriSmart, a performance shell fabric that absorbs and distributes moisture without closing up, and Transpor a multi-layer fabric that transfers moisture through the first (dry) layer onto the second (wicking) layer where it is absorbed, make Do Wrap products the perfect tool for sweat management. All Do Wrap Performance Headwear products are extremely comfortable, machine washable and retain their fit. Plus, Do Wrap products look great and come in a variety of styles and color. "We studied all of the performance headwear on the market and came away thoroughly impressed with Do Wrap," says Karen Peterson of Lexco. "Do Wrap Performance Headwear does everything with quality in mind. From design, to materials to manufacturing, they take the time to make their products the best." Says John Okon, CEO of Do Wrap Performance Headwear: "We're thrilled to have Lexco as a distributor of SweatVac products. Like us they're a Chicago-based company that has a great reputation in the industry." Ventilator Cap  Features one piece DriSmart Shell and Transpor Sweatband with a four-way stretch mesh top. Stubby Headband  A great sweat-control system in a headband. 60/40 Beanie  The ideal head garment in cool 40 to 60 degree temperatures. Winter Beanie  Controls sweat during winter workouts but keeps head toasty afterwards. Winter Headband  Great for under helmet wear, and it covers the ears. Performance Race Hat  Everything you would expect in a performance hat plus 40+ UPF Sun Protection. 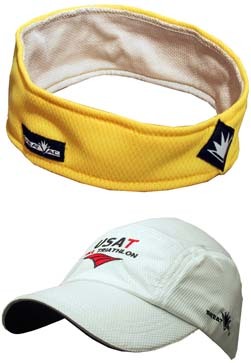 Performance Race Visor  Features SweatVac's multi-layer technology with a quality adjustable elastic strap system. For more information on Do Wrap Performance Headwear and other quality cycling products distributed by Lexco, e-mail sales@lexcobike.com or call (800) 626-6556. SweatVac is the inventor of "under the helmet" sweat management systems and has been providing the finest in technical headwear since 1993. SweatVac products are designed and produced with the endurance athlete in mind. SweatVac's exclusive moisture management system keeps the wearer's skin dryer then other products, thereby providing a competitive advantage.